Based on the power of Tayo, the character that has public confidence through the love of people around the world, Tayo Kids Café makes efforts to build the perfect spaces beyond fund and educational message delivered by Tayo to children. New little bus with a curious, cheerful and optimistic personality. A little bus with an outgoing personality fond of stepping forward and giving itself airs. A little girl bus with perfect charms – kind, cute but timid. An earnest little bus that is silent, thoughtful and considerate. A reliable two-story tour bus acting like the eldest brother of little buses. A cheerful and friendly mechanic taking care of the buses. <Tayo the Little Bus>is a joint effort by ICONICS, a producer of Pororo, the Seoul government and EBS, and a character that has grown through being loved so much by the children around the world since firstly aired in August 2010. 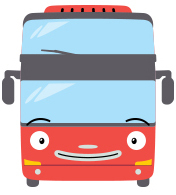 On the Public Transportation Day in March 26, 2014, the Tayo Character Buses operated by the Seoul government became very popular among children and even adults, and were also applied to the city buses across the country. 타Tayo has grown faster than Pororo, an all-weather top character of the Korean Wave. It is because the age range of the children who like Tayo is wider.